Hello and welcome to another edition of Sealed Success! I apologize for not being here last week, I was taken aback by the ever changing Texas weather and had an allergy bout suddenly come up and left me without my voice for a few days. Thankfully I'm more aware of the weather and should be able to avoid such occurrences in the future. You'll be happy to hear that I was finally able to draft in paper, unfortunately it was not triple Ravnica Allegiance as I had intended it to be. Our store got a shipment of a box of every single Standard legal set and the players all decided we wanted to Chaos Draft with the packs. With this in mind I drafted what I normally draft: removal.dek. 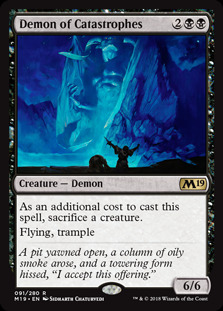 I was fortunate to not have to force it as black was incredibly open coming from my right and ended up with at least 7 pieces of removal along with a Demon of Catastrophes as a finisher to close out games. I went 3-0 before intentionally drawing in the last round (10 player pod) as while I enjoy removal.dek it isn't the fastest nor easiest to win games with. 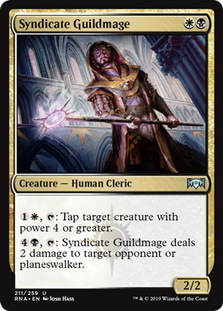 First pick was a bit of a tough one as Syndicate Guildmage and Mortify are close in power level and both send the same signal if you take one and pass the other. 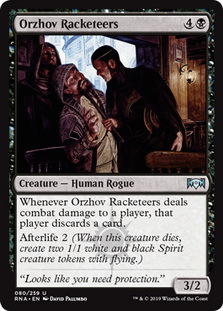 If I didn't take one I would have to remove the possibility of drafting Orzhov as I would be cut in pack 2 and that would be a very real cost if I decided to switch back to Orzhov. 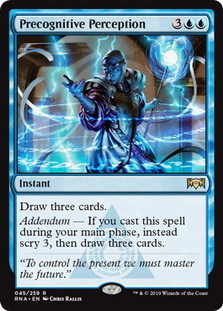 In the end Mortify is a very clean removal spell and while doesn't have as much utility as Syndicate Guildmage , it's a little easier to justify the splash if I end up in Azorius. The first pick in the second pack I believe was wrong, I should have taken Blade Juggler over Orzhov Racketeers . 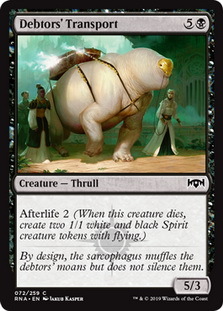 While the Afterlife 2 is nice the triggered ability isn't going to happen very often, so we're basically looking at a 5 mana 3/2 with Afterlife 2. 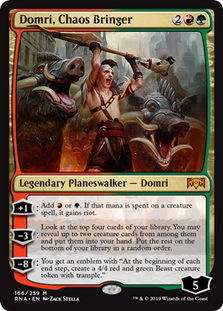 The problem here is Debtors' Transport is a 6 mana 5/3 with Afterlife 2, so for one more mana I get a better creature on offense/defense and still get 2 tokens when it dies. 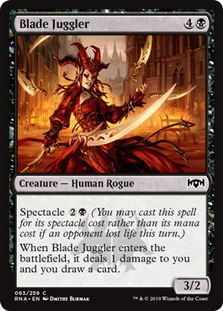 Blade Juggler has the same stats as Orzhov Racketeers but it draws a card and sometimes costs 3 mana. It doesn't change my deck very much, but it's worth noting I should be taking Blade Juggler much higher than I did here. The biggest twist in the draft was me deciding to pursue a blue splash for Clear the Mind and Precognitive Perception and while it worked, it's something I should have decided on much earlier to do. I stole the idea from an earlier match where my opponent had lots of removal spells and 2 Clear the Mind to rebuy their spells and in a pinch not lose games to decking. The idea is similar here except I didn't have the second copy of Clear the Mind and I had less card draw to churn through my deck over and over. The deck works but you need a smoother curve and card draw to bury your opponent in card advantage while they're stuck drawing one card a turn. The 2-1 record proves the concept can work, but it's something you need a bit of practice with to know when to go for it and how to construct the deck as you're drafting it. Dudes.dek surprisingly got there, although if we look at the context of the match our opponent had bad draws in both the first and third game allowing us to take advantage and attack for the victory. The third game would still have been winnable even if my opponent lands Kaya's Wrath earlier in the game because the combo of Guardian Project and Domri, Chaos Bringer would have made sure I had more than enough threats to win the game even after a board wipe. I can understand the hand my opponent kept if it had Kaya's Wrath and was one white source away from casting it, it just turned out my draw could easily beat it. After spending some time away from the pool and recognizing what I needed to make an Ethereal Absolution deck work I decided playing WB with a red splash was the best option given the lackluster options I had in terms of win conditions. It came down to playing mono creatures in UG or to take a slower approach with WB and hope the removal spells and Ethereal Absolution could win help win me games. In theory I have the requisite cards for the strategy to work, however I don't have the optimal cards to fully support it. I need a smoother curve and a way to be the aggressor so clogged board states don't happen. 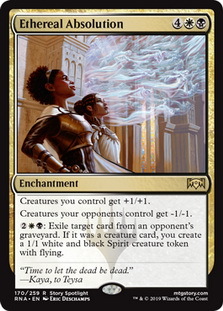 A card like Ethereal Absolution needs an engine to make it work and if creatures aren't going into your opponents graveyard then the card isn't going to work at full strength. 0-3 wasn't unexpected but I would have thought I had at least one match win in this round. My opponent had better draws than I did and my deck seems ill equipped at times to defend against whatever my opponent was doing. I did manage to take a game where my opponent was without lands for a few turns but even so I had to struggle a little bit to take that game. After losing 2 matches with WB I decided I wanted to try something different and switched to UG for the first game of the third round to see if what I needed to do was be more assertive and take an offensive stance. It didn't work out in the first game so I switched to WB and lost just as quickly as I did with UG. All in all my decks were not as good as whatever my opponent brought to the table but luckily with the extra pack and a 0-3 record we should find opponents in the next stage a little easier to manage. Sad to say I think my grim feelings about my sealed decks are going to be proven correctly as I have a lackluster record and it's possible I don't see much improvement next week. With sub-par decks it's hard to get traction going because you don't have the right pieces to make it all work, nor do you have the bombs you need to let you catch someone off guard and swing the game in your favor. Against unknown decks or better decks you're going to have to play tight and hope things break your way, but if you have the same power level between you and your opponent you can try to leverage play skill to determine the victor. That's the best chance I have at winning with my decks, hoping my opponent has about the same kind of deck as me and then playing better. If it sounds like hopes and prayers, well it is but it's honestly better than nothing. If you have any comments, questions, or concerns leave them in the comment section below.